To identify Effect removed (buff/debuff), we can get the ID with GetID() function in event "EffectRemoved", dont need to search in a saved table. If this can help, have a nice day. Last edited by Daorven : 04-22-2019 at 06:49 AM. Edit: also found an interesting thing, if you create a template to be blacklisted, every buff/debuffs containing that name will be filtered; for example, if I want to filter dissonance stance, it will also filter anthem of war - dissonance, because it has that keyword in it too (solution is to change the min time duration above 3 min, and the anthem won't be filtered). Last edited by Rhanti : 06-20-2018 at 11:19 AM. Is it possible to have an effect show if it is missing? So say for example I don't have hope buff going I would get a grey bar showing I am missing my hope buff. This is the only thing I can't seem to figure out with this add on. No, but you can do it with BuffMonitor. I am trying to set up individual windows for each trigger. They either show all triggers or none at all. I have tried deleting all unwanted trigger from each window. Doesn't work. I have tried leaving them all but blacklisting the ones I don't want for each window. Doesn't work. At this point I'm lost. PS: I edited these with CombatAnalysis Plugin. That screens are in CombatAnalysis. Last edited by gencagaer : 07-25-2016 at 06:41 AM. I made an icon for the plugin since its the only one of the plugins i use and it was missing one ;p I wanna share it here if anyone wants to use. Last edited by Tangaar : 11-30-2015 at 04:56 AM. Was wondering if anyone knew how to disable buffs coming from other players, without disabling those you do yourself......can lag a lot on raids, while you don't need to know every heals or buffs other would put during combats. Edit: only way I found is not to show any buffs that lasts for less than 3 minutes. Last edited by Plague : 09-09-2015 at 07:18 PM. > The last update by the author was 11-04-2013, is this plugin officially dead? Is there a replacement? Works fine here, why replace what everyone uses and works well? It's the standard, and integrates with Combat Analysis. The last update by the author was 11-04-2013, is this plugin officially dead? Is there a replacement? 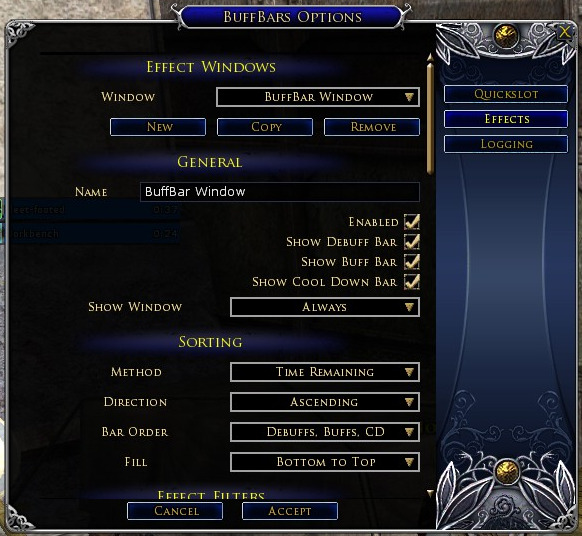 "c:\Users\[your windows username here]\Documents\The Lord of the Rings Online\plugins\PengorosPlugins\BuffBars\QuickslotB ar.lua"
Search the PowerChanged function (line 269) and just add the 3 line that I colored RED. Last edited by bunny : 02-02-2015 at 08:34 AM. 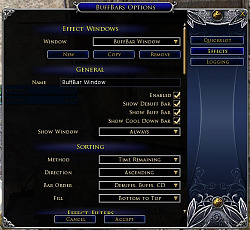 Would it be possible to track Class Specific Cooldowns on the Effect Slider? It only tracks Potions and Debuffs, or do i miss something here?